In the lovely village of Adare, found just 20 minutes from Limerick City, visitors can view the well-preserved ruins of a Franciscan friary established by Thomas, Earl of Kildare, in 1464. The remains include a tower, nave, cloisters and living quarters. The monastery had a turbulent existence, as it was briefly suppressed in 1539. The friars who had returned were later expelled in 1581. Mass continues to be celebrated here each year on Easter morning. The site is accessed through Adare Manor Golf Club. Visitors should check in with the clubhouse before proceeding onto the course to ensure safe access. The Franciscan friary of Askeaton lies by the river Deel, to the north of the village of Askeaton and the impressive castle of the Earls of Desmond, which stands on a rocky island in the center of the town. 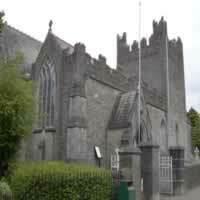 The friary was founded either in 1389 by Gerald Fitzgerald, 3rd earl of Desmond or in 1420 by James Fitzgerald Fitzgerald, 7th earl of Desmond. The extensive remains of the friary and its surroundings represent an imposing medieval architectural landscape that was probably planned intentionally in the early fifteenth century. It is an impressive foundation, due to its size, the extent of its remains and its proximity to the impressive ruins of the nearby Desmond castle. The church and its north transept, sacristy, cloister arcade and domestic buildings all survive, including the top floors of the east and west ranges. One of the most striking features of the friary is its beautiful fifteenth-century cloister arcade, with a devotional carving of St Francis showing the stigmata. There is a medieval hospice within the friary`s precinct. Among the detailed features are an elaborate sedilia in the south wall, three altar-tombs of similar design, a Mass dial in the cloister and a wall painting of Christ as the Man of Sorrows. A medieval wooden statue of the Madonna and Child and three medieval bells from Askeaton are now in the National Museum of Ireland, Dublin. 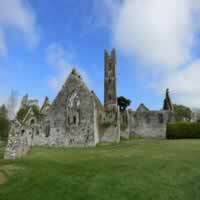 The abbey was founded in 1315 by the Earl of Kildare and was the second of three monasteries established at Adare. It was known as the Black Abbey due to the color of the friars` habit. Religious activities continued for about 200 years, until the community was suppressed in the mid-16th century. Today, visitors can view the well-preserved cloisters as well as the church, in use by the Church of Ireland since 1807. Also not to be missed are the Quin and Dunraven families` mausoleums. Under half-an-hours` drive from Limerick city (R445/R506) brings visitors to beautiful Benedictine Glenstal Abbey set on a serene 500-acre estate. Glenstal Abbey was built in the 1830s for the Barrington family. 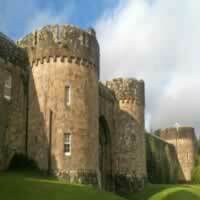 It was designed as a castle in 12th century style. It has a great gate and a massive drum tower that resembles the one at Windsor Castle. The Barringtons moved to England in the 1920s and in1927 sold the castle and lands to the Benedictine Order. It became an abbey in 1957. Scenic walks meander around the grounds, which are adorned with beautiful trees and flowers and provide a sanctuary for wildlife. The remains of Ireland`s old oak forest lie along the perimeter. The grounds are ideal for exploring and walking and include lakes, woodland and a walled, terraced garden containing a unique `Bible Garden`. Visitors are welcome, especially those seeking spiritual respite. Just to the south of the road from Limerick to Askeaton on the R859 road, Mungret Abbey reportedly dates back to 551 AD when a monastery was founded here by Saint Nessan. It grew into a thriving community with six churches and 1,500 inhabitants but declined after many Viking raids. 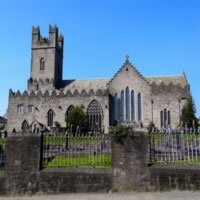 The site was reputedly given over to the Bishop of Limerick in the 11th century and one church later became a parish church. Three churches, one with a 15th century tower, and a graveyard survive now. Next to the road is a twelfth century church. This is a narrow structure with an east window and flat-headed west doorway. The largest church on the site, with the square tower on the western end, and surrounded by the graveyard is the parish church which dates from the first half of the thirteenth century with later additions. Although only a parish church the site has the feel of a Medieval cathedral. To the west of this is a small rectangular church which is probably the earliest church on the site. 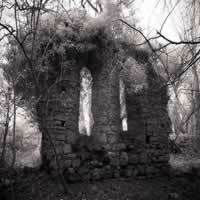 Just 1 mile south of the village of Broadford, sits the 15th-century ruins of the Killagholehane Cemetery and Church. The site is thought to be the location of an earlier Christian church, established after a peculiar summertime snowfall that covered the entire area, except for the field where the ruins sit. The church was later dedicated to Our Lady of the Snows. Now recognized as a National Monument, the site also includes an important Republican burial plot with a headstone commemorating the death of locals during the War of Independence. Situated in a secluded valley about 2 miles east of Shanagolden, this abbey is unusual in that it is one of the few medieval nunneries in Ireland. It was a convent of Augustinian canonesses, thought to be established in the 13th century and dissolved in the 16th century. The ruin includes a church, cloister and The Black Hag`s Cell, a room where, according to tradition, the last abbess practiced witchcraft. 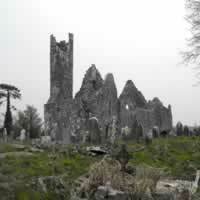 The Franciscan friary called Moor Abbey is east of Galbally village which is in a valley overlooked by the Galtee Mts. 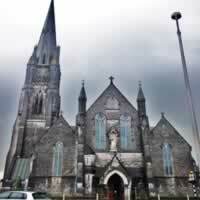 Donough Cairbreach O`Brien, King of Thomond, founded a friary for the Franciscans here early in the 13th century. 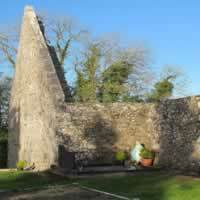 Galbally was a late Conventual foundation, begun in 1471. After its suppression in 1540, the new owner, the Earl of Desmond, left the friars in peace until Sir Humphrey Gilbert burned the building in 1569, and Sir Henry Sidney again in 1570. The friars did not return until 1645. Expelled by the Cromwellians, they were back in 1658 and remained (with a short break during 1680-4) until 1748. Following a rather complicated dispute with Fr. James Butler, V.G. of Cashel diocese, the friars of Galbally withdrew across the mountains to Mitchelstown, where the last friar of Galbally community died, probably in 1804. Only the friary church and tower remain today. Lots of flora can be seen in adjacent hedges including redleg, nipplewort, umbellifers, willowherbs, blackthorn, beech and oak, and local people have created a very pleasant roadside picnic area opposite the ruins. The Cathedral of St Mary Blessed Virgin is not only Limerick`s oldest building still in regular use but also one of its most historical and beautiful. It is located in the medieval quarter, adjacent to City Hall and a stone`s throw from King John`s Castle. 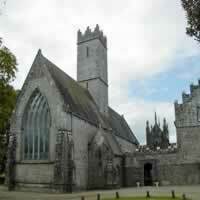 It was founded in 1168 on the site of a palace donated by Donal Mor O`Brien, King of Munster. Further back again, the site held a Viking meeting house The West Doorway (originally the entrance to the former Royal Palace) dates from the 12th century and it`s claimed that marks on the surrounding stonework were made by defenders of the city sharpening their swords during various sieges. This door is now only used during ceremonial occasions when those wishing to enter must knock first before entry is granted. A stroll through the interior takes visitors through a timeline dating from the early medieval ages to the present day. The vaulted roof, gothic stained glass windows, medieval floor tiles, and elaborately carved 17th-century choir stalls and marble tombs all bear witness to a tumultuous past. One trait of St Mary`s is music. The choir sings on Sundays and instrumental recitals are often held there. The tower is home to the famous bells and their distinctive sound has resounded through Limerick life for centuries. One of the most iconic sights on the Limerick skyline is the magnificent spire of St John`s Cathedral. The foundation stone was laid in 1856 and its crowning glory, the magnificent tower, was completed in 1882. The Catholic cathedral—which replaced a church founded in the 1753—was designed by English architect of note, Thomas Hardwick. The exterior, in Victorian Gothic style, was influenced by Salisbury Cathedral and was built by local builders, Wallace & Sons, out of Limerick limestone. The altar table is of Limerick marble and there are numerous fine examples of stained glass windows, statues and ecclesiastical art within. Six bishops are interred here. The tower, designed by local firm, Messrs. Hennessey, measures around 265 feet (including a cross atop it) and is one of the tallest church spires in Ireland. The bell was carried from Dublin via canal at the time. Although it has undergone restoration over the years, the cathedral has been in continuous use since it opened in 1861. 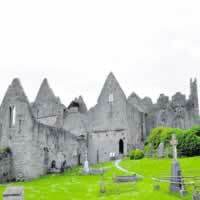 Founded by Geoffrey de Marisco in 1230 for the Trinitarian Order it was their only Irish house. Visitors can see the present Holy Trinity Abbey Church, which was once the country`s only Trinitarian abbey, founded in 1230. Apart from its religious purposes, the order worked to liberate Christian captives during the Crusades. The abbey was commonly referred to as the White Monastery due to the white habit worn by the monks. After its suppression during the Reformation, the abbey fell into ruin and today, the remains comprise tower, nave and part of the church`s choir. In 1811, the Earl of Dunraven converted the remains into the present-day Catholic parish church.